This week I am focusing solely on the value of vaccination. The first ever vaccine was developed in 1796 and vaccination in its modern form has been widely available since the 1920s. Since then, millions of lives have been saved and when it comes to disease prevention, only clean water can compete on effectiveness. In the last 50 years, it has saved more lives than any other medical procedure or product. Our capability to protect against disease through vaccination is truly remarkable. 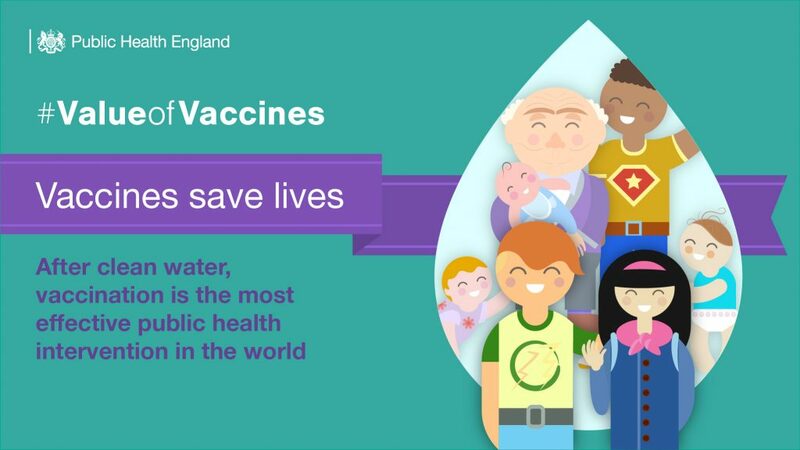 In the UK we have a world-leading vaccination programme, led by an exceptional workforce within PHE, the NHS and local government and evidence from PHE’s attitudinal surveys confirms that parental confidence in vaccines is very high. Since it was introduced in the UK in 1968, it is estimated that the measles vaccination has averted 20 million measles cases and 4,500 deaths and the rubella vaccine has averted an estimated 1,300 congenital rubella syndrome births and 25,000 terminations. In the UK we have eliminated polio, the flu vaccine is now offered to more people for free than ever before and hospital admissions for infectious stomach bug rotavirus are down 80% since a vaccine was introduced in 2013. We have seen some incredible public health achievements across the globe due to vaccination, but we are still seeing outbreaks, sometimes serious, of diseases that can be prevented by vaccines. Over the last week you may have seen the alarming story from America, where Rockland County in New York state declared a state of emergency following a severe outbreak of measles. In Italy, unvaccinated children have been barred from schools in response to a worrying decline in vaccination uptake nationwide and a large measles outbreak. These are extreme measures which governments in other countries have deemed necessary to protect people from a highly infectious disease that can kill, but for which there is a vaccine. In England, our vaccination rates exceed or approach the key global targets, but we are seeing a small but definite, steady decline in vaccine uptake and there is no room for any complacency. Thanks to the hard work of thousands of clinicians and scientists we have recovered confidence in MMR vaccines following the damaging, false and scientifically disproven claims put out over 20 years ago. We reversed the damage done then but now we face a new challenge, which is the proliferation of mis-information online, largely published overseas, but is easily found on social media platforms in England. Secretary of State Matt Hancock is leading on calling for social media platforms to remove inaccurate content and in this he has the full support of PHE. There is also action that we can all take in our different roles, in particular our GPs and nurses who are on the frontline, in reaching those not yet vaccinated. We must all speak confidently about the value of vaccines and leave the public in no doubt that they are safe and save lives. We must also work together and do all we can to ensure underserved populations – the so-called hard to reach - are engaged and offered vaccines. The new Regional Directors of Public Health on the seven new leadership teams for the different NHS regions of England offer a fresh opportunity to make progress on this and it is high on their agenda. Over the coming weeks and months we will strongly promote the value of vaccination and later this month we will be supporting European Immunisation Week, a World Health Organization (WHO) led initiative. I ask everyone to support this and help spread positive messaging and accurate facts about the effectiveness of vaccines. You can get more information via the WHO website and do look out for and share our content on social media. Get all the information you need on childhood vaccination from our blog. Yes...vaccination saves lives. Let us not forget the importance of promoting the completion of the neonatal hepatitis B vaccination schedule for babies born to women with hepatitis B. PHE IDPS programme and the Bloodborne Virus teams are working collaboratively to deliver the WHO Global Strategy Targets for 2030. Community pharmacists are a vital part of the healthcare professionals who can support with vaccination; Flu is a nationally commissioned service and some areas see community pharmacists offering other types of vaccination both privately and NHS-commissioned. I believe there are many more opportunities to involve community pharmacy in supporting PHE to deliver to its vaccination targets. As an NHS nurse for 43 years, I am a great believer in protection by immunisation through vaccination. Indeed my very first ward as a student nurse was an infectious disease unit, where some of our patients were suffering from those diseases for which vaccination is now available and also where iron lungs were very much in use. How wonderful that we can now offer vaccinations to prevent the suffering and death that such awful disease could mean, but what a bad thing it is that so many still cannot receive this treatment through ignorance, the will of others, or by distance.